While Abbie was on medical leave from college, languishing in Ohio with mono and a side order of other debilitating ailments, she felt a puppy would be the perfect tonic, something small, cute and therapeutic. And so, when she came home to Skaneateles, she was accompanied by Gus. A stealth dog, sneaking into my home and into my heart. Gus is a toy dachshund who tips the Toledos at a little less than eight pounds. He has magical properties. The first time I ushered him into his dog crate, I was astounded to see a second dachshund emerge even as I was pushing on the first. The new dog bore a striking resemblance to Gus, and in a moment I realized it was Gus, who had made a weineresque U-turn inside the crate and — secure in the knowledge that I had one hand on the crate door and the other on his rump — trotted right past me, a dog at liberty. When Gus is in full possession of his cool, he is Mr. Jaunty, head held high, ears perked up, moving forward confidently with a crisp, rolling gait. If he doesn’t want to go somewhere — he hates rain, cold or pointless walking — he sits down and trembles, a drama queen. “It is too cold, too wet, too far,” his expression cries. Turn and head back for home, and he becomes Mr. Jaunty again. In the backyard, his backyard, he is at the top of his game. Birds, especially those plump, Perdue-tender robins, engage his attention readily. You can almost see him firing up the grill and whipping on a chef’s hat as he dashes out to the end of the leash. Squirrels rob him of all reason, and when he flushes a rabbit from the forsythia, you can hear the call of hunting horns as he takes off in pursuit. We reel him in before he catches any wildlife, but he will eat anything that cannot run, indoors or out. So far, I have removed from his reluctant jaws several price tags, dust balls, seed hulls that the birds toss to him, a dollar bill folded into a ring, a makeup brush, and a wad of bright orange gum expelled by some local youth on his or her way through our yard. For his staple fare, Gus must settle for kibble, and is presently bright-eyed and healthy on Purina ONE, supplemented by little biscuits that reek of liver. The biscuits reward Gus when he does something laudatory, and perfume our pockets while we’re waiting for Gus to do something laudatory. In solidarity with his Teutonic brethren, he is stubborn. When he plants his feet on terra firma, he is almost immovable, rooted like a bonsai oak in the Black Forest. But plucked off the ground, he can be draped over the arm like a small pelt. Speaking of pelts, Gus is dapple, or brindle, mostly black with gray spots. When stretched out in a sun-pool on the hardwood floor, he looks like a seal on a rock. Only his brown paws and face mark him as land-based creature. Gus did come with house-training issues, but we are praising and bribing him for good behavior and giving him frequent outdoor opportunities to earn our thanks and approval. We did consider bringing in Heather Tully, the Bobby Knight of dachshund trainers, but thought we’d at least try it ourselves before sending all the way to Seattle for a pro. I had not planned on Gus, but I had missed having a dog in my life. I mean, when was the last time a friend was so excited to see you that they peed on your shoes? And there is something wonderfully soothing about having a dog sleep quietly in your lap or next to you on the sofa. We are looking for more of this from Gus. Abbie was home for a visit, and her primary concern before she arrived was whether or not Gus would remember her. There was nothing I could say to reassure her. But Gus took care of everything. As she appeared in the doorway, the tiny Argus barked once, hesitated for perhaps a full second as she stepped forward, and then launched into one of the grandest welcoming displays I have ever witnessed. Drops of piddle were strewn like rose petals in Abbie’s path. He went into a full-body wag and began vibrating so every part of his body appeared to be moving in two directions at once, three as he leaped like a Lipizzaner, bouncing on his back legs until Abbie scooped him up at which point he unleashed a pyrotechnic volley of dog kisses, eyes wide, heart pounding, paws scrambling, a dachshund in ecstasy. “I think he remembers you,” I said, displaying my gift for restating the obvious. He remained glued to Abbie’s side, and in the morning, slept in her suitcase until the door to her upper sanctum was opened, at which time he galloped upstairs and vanished under her bedclothes, rooting for the perfect spot as only a narrow dog with a pointed nose can. The next afternoon, I walked into the living room and found him in Abbie’s arms, on his back, legs wide spread, eyes tightly closed, as she softly rubbed his belly. La Prima was home, and all was right in Gus’s world. The evening of July 25th, at dusk, I took Gus for a walk in Austin Park. It was a little before 9 p.m., a quiet night. We strolled along the pedestrian trail, halfway between the tennis courts and the old Allyn Arena. I gazed at the skies in the west while Gus sniffed in the grass. There was no sound except the light breeze and the gritty hum of fast approaching tires. I turned and saw the car, lights out, black, coming downhill out of the darkness, headed to and through the spot I was occupying. I stepped off the trail, picked Gus up and turned as they went by, a small car, four teenagers inside. The driver was a young man with a blondish crew cut, one hand over his mouth like he’d just won something on “The Price Is Right.” I only had time to share a single word with him, but I think I found one that summed up his character. And then he was past, threading his way through the parked cars at the Arena, turning on the car’s lights, and pulling onto East Austin Street in all innocence. The next afternoon, I looked both ways before entering the park. We were at about the same spot on the pedestrian trail when I looked up at a soaring dark silhouette in the bright sky, a bird of prey doing the math on my eight-pound dachshund. It was something in the way of a huge hawk or a medium-sized eagle, but I had not thought to bring Peterson’s A Field Guide to the Birds. It circled, and I scooped Gus up, letting the bird know this was a shrink-wrapped two-fer and he’d better have enough on him to take us both up to the register. He veered off, calmly, and headed west. Gus and I opted to go home. Anyone who tells you that walking a dog is relaxing has not dealt with the raptors of Skaneateles. Gus is playful by nature and our home, once ready for the photographers from House Beautiful, is now littered with his play things. Here an oriental rug, there a rubber boomerang. Of course, there are rawhide bones, one for serious chewing on the first floor and another for the second. He loves squeaky toys but savages them so quickly (especially the much lamented plastic pork chop) that they are not cost-effective. He loves socks, and can often be seen running into a room, as if chased by a pack of wolves, carrying a trophy sock high and then snapping it into submission. It is not a good idea to take your socks off in his presence, and overly optimistic to expect both of them to be there when you decide to put your shoes back on. He also likes shoe laces, especially the little plastic things at the end. His latest toy, of which he is especially proud, is a tennis ball he found in the park. Upon discovering it in the grass, he looked at Laurie with fervent hope. All the way home, the ball clenched in his fully extended jaws, he shot glances over his shoulder to see if it was really okay to carry away this treasure. And when he was allowed to bring it into the house, the angels sang. The bright green fuzzy ball is truly his and he loves it madly, yielding it only to someone who is willing to throw it into the next room. Fingers and toes, especially wet toes, also figure prominently in Gus’s list of favorites. It is not easy to walk to or from the shower if Gus is present. When I sit down, anywhere, my hand is swiftly drafted into action as a small animal. Gus gnaws on my fingers and wrist. His back paws vigorously defend his vulnerable underside while his front paws position my hand for chewing. He accompanies this mock combat with much eye-rolling, growling, and rolling of the body. We are evenly matched. 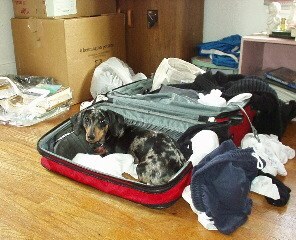 A visitor this past weekend asked me if I had always wanted a miniature dachshund. I replied, “No, I don’t like purebreds, I don’t like small dogs, I don’t like short-hairs, I don’t like dogs that bark. But I love this dog.” I had shared this with the woman who cuts my hair, and she said, “Kihm, he obviously was sent to challenge your assumptions.” And so Gus does. Watching Gus squint with pleasure as he rolled and rubbed in the grass over the corpse of a dead mouse, I was led to ponder the issue of scent. Today, young men make use of body sprays with scents like Kilo and Voodoo to attract young women who sport flared nostrils and clouded judgment. It’s a new product category, but here was Gus showing me the timelessness of the practice, picking up some free-range odor for his own joy and the envy of others who might trot by. We were blessed with a visit a few weekends ago, friends and their daughter, Ella, not quite two years old. Because Gus had never dealt with a toddler, I was curious to see how he would react, and concerned that he behave himself. And then she was walking around the living room, smiling. Gus leaped up, putting his paws almost on her shoulders, looking devoutly into her sparkling eyes. She squealed in delight, a high-pitched squeal in a register usually reserved for birds. That’s her “happy scream,” her mother noted and not to worry about the jumping; Ella lived with two dogs and she was used to it. But this was not the usual jumping play of boisterous pooches. No, Gus was in love. Yes, an older, smoother dog might have gone outdoors and returned with a nosegay of wild flowers. Or carved “Gus + Ella” in a nearby oak. Or drawn a heart on white paper with red crayon. But not Gus, not now. Rather, Gus was comporting himself like a sailor who’d had too much palm wine at the luau. Moving to the music of his heart — apparently a Polynesian rhythm — he placed his front paws on his little Hawaiian princess and began to hula. Nor was this shaping up as a traditional east-west hula, but rather more of a north-south hula. Gus’s name was now being raised in chorus by the flustered host and hostess, but Gus was far away in the Sandwich Islands, intoxicated by the perfume of orchids and Cheerios. I have spoken of Gus’s love of tennis balls, and his collector’s passion for the forgotten home-runs of Skaneateles tennis players. He has nine now — 5 Penn, 3 Wilson and 1 Dunlop — all bright yellow green and each a pearl beyond price. But his trophy ball, the big prize, the safari-maker, is a basketball-size yellow gold fun ball he found near the baseball diamond in mid-summer. It was too big to carry, so he herded it home, curling around it, bumping it, nosing it, heading it, occasionally rolling right over it with his entire dachshund body, even offering it up to us so we could kick it and he could give chase. It rests in the front closet now — next to his arch-enemy, the vacuum cleaner — and comes out on days when weather and scheduling permit an extended romp in the park. Gus shows us in every way that to be free and running with a ball in the park is to be truly alive. The ball is rolling; life is good. Gus believes that barking is a birthright, a good and natural thing for a dog to do, and a vital part of our home’s defense. Gus’s territory extends as far as he can see. From his perch atop the back of the sofa, or on the arm of the green chair, he keeps watch over much of East Austin Street and Austin Park, barking at all animals, including birds, and any people who walk, run, bicycle, skate or drive. He also barks at hot air balloons — in short, anything that moves or belches fire. And so, by Saturday evening, Gus was able to settle down and get back to his regular weekend routine, barking at Catholics. Living just up the street from St. Mary’s of the Lake, we see many people coming to Mass and going home. Gus barks at them both ways. I have tried to explain to my little nine-pound protestant that these people have every right to pass before our house, probably don’t pose much of a threat, and that attending church is often a positive choice in this life, but he is unswayed. I have asked him to deal with people one at a time, and not lump them into groups and make sweeping generalizations. But he will not listen. Perhaps this is my family’s history coming back to haunt me. My father’s father insisted that if John F. Kennedy was elected president, the Pope o’ Rome would pack his bags that day and fly to Washington to run the United States of America. My mother’s mother insisted that the Roman Catholics were recruiting “all the colored people” in order to overwhelm Protestants with sheer numbers. These declamations took place over the dinner table, where you can be sure we didn’t eat fish on Friday. Perhaps in reaction to this, I grew up with a more ecumenical view of world religions, believing in tolerance and acceptance, without much patience for theories of conspiracy and world dominion. But now my dog is barking at Catholics. I tell myself that if we lived on Genesee Street, he would bark at Presbyterians instead. But I could be wrong; he may just be descended from one of Martin Luther’s dachshunds, or is my grandfather reincarnated, and there is just no reasoning with him. Christmas morning found Gus in our upstairs office in his Orvis Snuggle Ball, a large, poofy, green bed with his name embroidered on it, his preferred bed, his overnight bed, where each evening he climbs up and sinks down into slumber. He began whimpering at 6:45 a.m., and so I brought him into our bedroom and up onto our big bed. He was deliriously happy with this rare treat, and shot under the comforter, worming into a new sleeping place where he rested for another 15 minutes, before hunger overtook him at 7 a.m. They say the first thing you must do on Christmas morning is feed the animals, and Gus believes in this tradition wholeheartedly. After a bowl of Christmas kibble and a short jaunt outside, Gus came inside charged for the first nap of the day, which he took in his Wal-Mart bed in the kitchen while we waited for Abbie to wake up. For the opening of gifts, Gus took up a position on the sofa, and then came down to floor level to sniff his present, a Doxie Dream Sack, which looks like pocket bread, and hence is known as his Pita Bed. The new bed had some allure, but it could not compete with Grandma’s lap. Grandma was up from Richmond, and Gus had found a new home, where he remained until Abbie, exhausted from the holiday, went back to bed, taking Gus with her, to sleep under the covers until noon. After another walk in the bracing air, Gus spent more time in Grandma’s lap on the end of the sofa closest to the fire, listening to Christmas music, eyes closed, emitting an occasional sigh as Grandma softly petted him. By day’s end, he was truly ready for a good night’s sleep, back in his poofy bed, dreaming of sugar plums. People who find the holidays exhausting will find Gus in agreement, if they know which bed to look in. In the evenings, Gus customarily joins us on the sofa, finding a lap or a gap in which to be comfortable, either curled up like a cinnamon bun or stretched out like a sausage. Sometimes he watches TV with us, following the action with equal interest whether it’s a cooking show, a mystery or a tour of someone’s mansion. But the other night we discovered he has limits to his viewing. For Gus, whose life rests on the four pillars of eating, sleeping, playing and soaking up affection, the notion that dogs would work was too much to bear. He stood up, turned about, dove under the sleeve of Laurie’s sweater, burying his head and showing the television naught but his sleek posterior. He ran on without a word. Then it dawned on me that I’d heard, “Are you going to pick that up?” many times at book sales, and I have always replied graciously, “No, be my guest.” Perhaps the runner had wanted this offering for his lawn. After all, Gus eats premium dog food and this perfect little loaf was fresh from the oven. But no, I was too busy being the lord of the manor, coming off as huffy and selfish when “willing to share” would have been much more the order of the day. Those we love can get away with things that would just be unacceptable coming from anyone else. It is as if our heart has a reserve tank of patience and tolerance that can only be tapped by its intimates, a supply of forbearance that is unavailable to casual acquaintances, co-workers or strangers who cross our path. In particular, I am thinking of last night when Gus chewed off the end of my watch band. I was watching “Queer Eye for the Straight Guy” at the time. Gus seemed to have calmed down after a frantic bout of hand wrestling. As he nuzzled my left wrist, he had a dreamy look in his eyes, a look that said, “You’re great, Dad.” I was rubbing his soft, flappy ears and not really paying attention to exactly why he was so content while his jaws worked at the soft leather and I marveled at the Fab Five’s latest makeover. Only when I checked the time did I realize that the end of my watch band hung by a thread, a very wet thread. When I took the watch off, the thread snapped, the leather fell to the floor and Gus snuffled it up swiftly because he is a very neat dog. My attempts to effect a return of the savory scrap before he gulped were fruitless. After that, my thought was that I could probably cut off the end of the band a little more evenly, but no real harm was done. Fortunately, I do not wear leather pants. Marvelous stuff. I read it aloud within earshot of Gus, and could see straight away that he was taken by the notion that a dog could garner praise for something as simple as a poem. Because today Gus is two years old and his First Person is 21, it seems a good day to write about the burgeoning love Gus has for NewsChannel 9’s Chief Meteorologist, Dave Eichorn. I was at home with a cold one day and got to see the proof with my own eyes. Laurie and I were on the sofa; Gus was on Laurie’s lap, snoozing, when Dave Eichorn appeared on the screen and began to speak. Gus’s ears perked up, followed by his head, followed by his body as he launched himself into the air, landed directly in front of the television and leapt up repeatedly to make eye contact with Central New York’s most trusted weatherman. “Does he do this every evening?” I asked. “Just about,” was the reply. Gus spun around to see if we were leaping, too. “As soon as the Weather is over, Gus,” Laurie said, and the reason for Gus’s passion became clear. Laurie, who comes from a family that could be fairly described as “weather-involved,” will not make a move without sure knowledge of the forecast and one of her touchstones is Dave Eichorn’s report during the 5 O’Clock News. And one of the moves she will not make until Dave has finished is feeding Gus. Whatever Dave Eichorn is saying to the rest of Central New York, what Gus hears is “Dinner is served.” If Dave spoke with an English accent, wore butler’s livery and bowed slightly, his message could not be any clearer to our dog. This man’s arrival on the television signals imminent dining, and Gus loves him for it. Madly. Somehow, Gus has come to understand that Dave Eichorn gives Laurie the green light, and she fills Gus’s dish. Whatever Dave’s viewer ratings are, or may some day be, he can always count on a heartfelt paws up from Gus Winship. Evenings bring out the beast in Gus, the hunter at dusk, bounding into the living room with prey in his mouth, be it a white sock, the rope toy or his Kong toy. Our veterinarian told us that dogs are still made up of 95% wild animal DNA, and we believe. To keep his skills razor sharp, Gus requires us to fight with him for his prey, a struggle he allows us to win, then throw it into the dining room so he can chase it, bring it to the ground, dispatch it with quick bites and neck snaps, and return it to the sofa to be thrown again. The Kong, made of rubber and configured like a snowman, is perhaps the most elusive of all his victims, taking bounces that defy description, sudden verticals up and across the dining room table, super sharp turns, freakish hops into parka hoods, and rapid scuttling dashes into the bathroom. It’s almost human. After hunting, fighting and feeding, at a signal that only he can hear, Gus decides it’s time to rest, finds a spot of the sofa with protective cover on at least three sides, and drifts into contented sleep. What Gus lacks in size, he makes up for in volume. On Monday, while in the backyard, he stuck his head into a shady little hollow under an ornamental grass and found himself face to face with a cat. A mere six inches separated these two similarly sized but differently configured animals, and this proximity came as a rude shock to a dog who thought he was just outdoors to sniff and scent the foliage. His first bark, more of a cry really, exploded from his body before he’d even had time to think about intonation. The note Gus hit would have done credit to a Wagnerian heroine placing a primal call for help without the aid of a telephone. The cat, thanks be to God, decided to retreat, and Gus, miraculously, did not pursue. But he continued to bark as if he’d lost his mind and the cat had it and was sticking pins in it. His world reeling, Gus wailed out against the injustice, the insanity, the fundamental wrongness of a cat, here, now. No words of comfort could provide balm for his shocked and fevered soul in this, his time of trial. Farther down the property line, the cat poked its head through a row of ferns, trying again to get home but finding itself still blocked by a crazed dachshund, now barking from its owner’s arms. There wasn’t an ounce of hostility in the cat’s expression. The cat appeared baffled, as if it had lived with dogs and always found them to be great pals. A neighbor appeared and took his two Newfies indoors. They too wore expressions of “What is wrong with that dog?” as they lumbered through the back door to escape the noisy outburst that had shattered their quiet afternoon of leisure. As my words failed to have an ameliorating effect on this bout of doggie hysteria, I carried Gus indoors so he could get a quick drink on his way to taking up a position at the front window, ready to bark at his usual ration of walkers, runners, bicyclists, children, the elderly, motorcycles, trucks, squirrels, birds, the man mowing grass in the park, and, of course, any other dogs having the gall to walk or run within a quarter mile of our house. I have uprooted 750 dandelions since the snow melted, approaching the 820 mark set in 2004 and it isn’t even June yet. I’m pleased to note that while working, I have been accompanied by Gus, who is learning that he is free to run around as long as he stays in his own backyard. At least once a day, I like to open the back door and let him run down the steps and out the path to the shed, unencumbered and free. It does both of us good. I am, of course, flirting with disaster because certain things trump Gus’s self-restraint and his memory of where the boundaries lie. Last weekend, for example, I opened the back door, stepped out onto the deck and saw a rabbit sitting in the middle of my neighbor’s yard. Gus hadn’t seen the rabbit yet, but I knew it was only a matter of seconds. “Gus,” I said, to get his attention. But by then he’d seen the rabbit and his attention was divided. The rabbit had 100% of it and I had 0%. It was amazing to see Gus turn on the radar and hit the afterburner. Fortunately for the rabbit and myself, Gus’s legs are only six inches long. But even with my stride advantage, I was barely keeping up. The rabbit was clearly the fastest of the three runners and was already out of sight when Gus and I ran past the second rabbit, who had been sitting in the middle of the next yard. That rabbit chose to take flight in a new direction, calling for a mid-course dachshund correction. As I carried him back to the house, brushing the wet grass off his head and snout, I explained that his outdoor idyll was at an end. There would be no more rolling in the leaves, no more peeing on the ornamental grasses, no more chewing on seed hulls at the feeder. He was going inside to think about boundaries. The loyalty of companion animals is legendary, and Gus is a fine example. I have never met a dog more loyal to food. Gus does show interest in his people, and greets us happily when we return home, but seconds into the reunion he heads for the kitchen and indicates that food is the way to keep the party going. At daybreak, Gus likes to join us in the big bed for a half hour of communal slumber and den behavior. But if we tarry too long, he begins moaning, each moan having more syllables than one previous, in an earnest effort to bring his breakfast to the forefront of our consciousness. He hits the floor fully dressed and ready to go, and cannot believe all the steps we ill-equipped humans must take before the day can begin. If he could say, “Oh, come on!” as I pull on my socks, he would. Breakfast, lunch and dinner last about 15 seconds, followed by a circuit of the floor below the birds’ cages for seed, his equivalent of the port wine and cheese course, if I’m reading him correctly. Gus always eats before we do, which leaves him free to observe us as we dine, following every trip of the fork between plate and mouth. He cannot wait for us to get old. He envisions a paradise of shaky hands, falling morsels, and plates left forgotten on TV trays. As it is, he bounds up onto the sofa between dinner and dessert to Hoover us off, lest we be crummy. No gravy on my tie. The other day I was reading the Bible while eating popcorn, dropped a piece and Gus very nearly ate an entire chapter of 1st Samuel. Hey, it was buttered, and he probably would have had an easier time digesting it than I was. The books all tell you never to feed a dog from the table, but Gus assures me this is poppycock. From his accustomed spot next to my chair, he will beg for anything, including eggplant. For chicken, he goes out of his way, for pork he is passionate, and for beef he will perform the St. Crispin’s Day speech from Henry the Fifth. But he rarely does more than two lines before I get misty at “We few, we happy few, we band of brothers” and slip him the best piece on the plate. On nice days, Gus is Mr. Jaunty, conveniently deaf, independent, stubborn, even surly if my requests are not in harmony with his desires. But when the barometric pressure drops, the sky darkens and the drumbeats of thunder approach, his confidence deserts him, and his hauteur is replaced by a naked plea for protection. The other day, a fast-moving storm front found me in my usual spot, at the window, marveling at the power and majesty of nature. I heard Laurie say, “Someone is trying to get your attention.” I looked down, and there was Gus, looking up, hopefully, expectantly. I turned back to watch the black clouds, waiting for the first jagged lightning bolt, when I felt pressure on the top of my foot. I looked down again, and saw that Gus had now planted one paw on top of my sneaker and was leaning on it to make his point. Short of a written request, this was as clear a message as I was going to get, so I picked him up and held him. For the next couple of hours, Gus was my close personal friend. Close as in touching. At bedtime, he was not about to sleep alone. When I got under the covers, he got under the covers. With each thunderclap, he managed to press more and more of his body onto mine. And so we went to sleep. At about 3:30 a.m., I woke up; the storm had passed and I whispered to Gus that he would have to go to his own bed. He ignored me. When I lifted him up, he growled. The skies were silent now, his confidence was restored, his natural ill-mannered nature back in place. I accepted the growl as a flattering sign of his disinclination to be parted from me, and carried him off to the bed that has his name on it. If one of my co-workers placed a fingertip on my glasses, I would be upset. But when it’s my one-year-old granddaughter, Bella, leaving her tiny print on the lens, her eyes narrowing as she ponders the mystery of something clear but hard, something you can see through but not move through, I am not upset. Maybe it’s the Zoloft. Or maybe I am in a state of awe, wondering how I went from the father of a child to the grandfather of a grandchild. Marveling at her beauty and disposition. When visiting with Bella earlier this month, I could not help but note the similarities between her and our grand-dog. Bella and Gus both like to eat, and if food is placed just out of reach, or you’re a little slow in getting it ready, they both let you know, audibly. They sound about the same. When they are sleeping, they are beautiful. But Bella is finally pulling away in the smarts department. She can hold up one finger to indicate how many years old she is. She can clap her hands. She is leaving Gus in the dust. Gus calmly accepts this, perhaps because he has other concerns. His latest crisis, and it can only be called a crisis, came at dinnertime earlier this week. Laurie had just put Gus’s dish on the floor when the UPS man came up the front steps. Gus, as I have noted previously, is devoted to food. It trumps all else. However, the UPS man is his sworn enemy, the very face of evil, someone who, save for Gus’s barking, would enter our home to take away all our food and toys. What was Gus to do? Eat his dinner, or raise the alarm? Certainly Gus could not leave his dish, lest some other member of the pack take his food. Nor could he bark with his mouth full; he tried that, but all that emerged from his clenched jaws was a faint, muffled “ooofff.” If ever a dog was torn, it was Gus. Every fiber of his being was caught in a tug of war. His mouth kept eating, but his eyes, fixed on the front door, were wide and wild. His feet jumped; his long body quivered. The idling brown truck, the approaching footsteps, the shadow, the doorbell, these are all calls to battle. But there was the food. It is a wonder Gus did not tear himself in half. Only when he finished his dinner was he free to charge the door like a crazed barbarian, calling down the pagan gods of war upon the retreating delivery man. With conflicts like this one, it is no wonder Gus does not have time to fret because his half-sister can hold up one finger, clap her hands, and rear up to walk on her hind legs. They say that you cannot teach an old dog new tricks, but Gus taught me one a few weekends ago. It began with Squeaky, Gus’s most favorite toy, a red ball that mimics the sound of wounded and terrified prey. Each morning, after wolfing his breakfast and going outside to leave notes for all the other dogs, Gus likes to return home and accept delivery of Squeaky. He hits me with his most expectant expression; I take the toy from its accustomed place on the counter and give it a toss. Gus then chases and brings Squeaky to bay, gives him several assertively squeaking bites and then takes him to a corner of the sofa where he can guard his prize from the rest of the pack and, whenever the mood takes him, give him another loud and savage throttling. This works for most of the day, but when Laurie and I are ready to settle in for dinner and a movie, a sudden attack on Squeaky can obscure critical dialogue and shatter any mood the filmmaker has worked diligently to create. Because of this, we try to recover Squeaky before the dinner hour. If Gus is distracted, perhaps out at the kitchen counter waiting for food to fall from the heavens, it’s not a problem. But if Squeaky has Gus’s attention, you really don’t want to just reach in and try to take it away. Gus is not some big, amiable Golden or Lab who will say, “Okay, I guess I was done with that.” No, Gus is the smallest yet surliest dog in the pack ready to engage in mortal combat to protect what could be his last meal. Being firm and strong, or calm and gentle, these have no effect on Gus. Bribery, on the other hand, works like a charm. Half a crunchy biscuit stuck in another toy and tossed well away from Squeaky sends Gus flying off on a new hunt and cleans his teeth besides. Food, as I have said before, trumps everything in Gus’s game. So, a few weeks ago, Gus and I found ourselves having a bachelor weekend, watching movies like Red Heat, Die Hard 4, Kiss of the Dragon — all our Jane Austen-inspired favorites. I was in the kitchen lavishing the final touches on my meal presentation when I heard a bumping, bouncing noise at my feet. I looked down, and there was Gus, with Squeaky. Gus looked at me, then up to the counter where his toys live, pushed Squeaky forward with his nose, and then looked at me again. He made the circuit with his eyes twice more, just to be sure I was getting the message: I didn’t have to take another toy stuffed with a treat into the living room to swap for Squeaky; Gus would deliver. And he had. He’d figured out how the trade-in worked, and was willing to expedite the process for me. If I was smart enough to figure it out. The benefits, of course, are immediate. My history with my own alma mater is dicey at best, but now I have a college I can cheer for, with athletic teams of total strangers I can embrace as my own. There’s even polo. Go Big Red! Those of you who know Gus might peg him as a Drama major, but it was our veterinarian who suggested Cornell, specifically the Cornell University Hospital for Animals, one of the most renowned teaching institutions in the eastern United States. Dr. Bruck looked Gus in the eye, the right eye actually, and said, “Ophthalmology,” a major I couldn’t even spell. We arrived on campus on Monday morning, aglow with excitement. To keep Gus fresh for his interviews, Laurie filled out the admissions paperwork, and Gus was on his way. And what a student. In just a few short hours, he passed all his tests with flying colors. I thought his audition for the glee club went especially well. When it came time for graduation, I had to blot tears from my own eyes. And when I learned that his tuition was only $170, I bought a Cornell hat. Much of Gus’s life seems to be taken up with the quest for the perfectly comfortable position. He is tireless in his pursuit of this lofty and some times seemingly unobtainable goal. While Laurie was away recently, I left the bedroom door open at night so Gus could wander in from his bed whenever he felt the need for company. One night he appeared at about midnight and I hauled him up, and quickly went back to sleep. An hour or two later, I awoke to the sound of murmuring, as if people were talking softly in another room. But it was only Gus, making sleepy sounds. He was under the covers, except for his head, which was on the center of Laurie’s pillow. You would think that was true comfort, and sufficient for any dog, but when I awoke a few hours after that, Gus had slithered under my right arm and I was softly petting his side even as I woke up. It was then that I discovered where Early Man got the idea for the rotisserie. Every minute or so, Gus would roll carefully to expose some new, unpetted surface — his belly, his other side, his back — so that without my moving, he could be assured of even coverage. During the daylight hours, when Gus is not barking at passersby or looking for dropped food, he reclines on the sofa, generally atop a throw pillow, and under a green and yellow afghan. When the afghan begins to smell more like a dachshund than most dachshunds, Laurie puts it in the wash. This is crisis-time for Gus, who lays on the sofa, exposed and uncomfortable, and whimpers until the afghan returns, warm from the dryer. In the evening, during movie time, Gus must choose between the space between my outstretched legs where he can fully extend himself with his ears flapped out like wings or the space between Laurie’s outstretched legs and the back of the sofa, or the space between myself and the arm of the sofa, usually underneath the afghan. If he can draw warmth from both Laurie and I at the same time, it’s an added bonus. These are not easy choices, and Gus sometimes stands on our laps and looks at each potential space like a shopper judging the ripeness of fruit. Where will I be happiest? Should I curl up or stretch out? Should I remain watchful, or burrow into safety? If somebody gets up, will I have to move? You can see that it’s not just about lying down. There’s an art and science to it, and a careful weighing of the consequences. Gus takes on the challenge every day. And when he finally does find a good spot, lies still, inhales deeply and lets out a long sigh, I sigh too. The sofa at my house is the epicenter of envy. In the morning, as I lace up my boots in preparation for the wintery walk to work, my dog lies curled up beneath an afghan, a loosely knit green and yellow afghan he has appropriated for his own use as a nest, a canopy of camouflage, a warm retreat where he nestles, invisible, well-fed, content, and set for a morning of leisure. I look down at this bundle of bliss as I zip up my coat and pull on my hat and mittens, and I am more than envious. I am green with envy. Lime, pickle, emerald, forest green. But at dinnertime, the tables are turned. I sit in his spot, the afghan now cast over the arm of the sofa, with a TV table in front of me, upon which is centered a plate of richly aromatic people food. Often it is chicken, some times pork, on special occasions lamb, or even fragrant beef. Gus sits on the floor in front of me and stares, his eyes moist with tears, his nostrils quivering and questing, murmuring a little doggy prayer for manna from heaven, anything, please, perhaps a rolling green pea, a leaping kernel of corn, a few wayward bits of windblown couscous that might even have rested right next to the chicken, touching it, perhaps even imbibing its juices. He watches as each savory morsel disappears into my mouth, the mouth of privilege. He is envy made manifest. At least until the following morning, when I pull on my boots, and he gloats.